Aside from the tangible benefits of volunteering, which may include building a house for Habitat for Humanity or getting clerical duties done at a hospital, the intangible benefits of volunteering are numerous. A volunteer may benefit from an improved sense of self-worth, pride and accomplishment while improving the lives of others. Hospital jobs provide the added benefit of interacting with those you are helping so you can see the difference you make in the lives of others. Hospital volunteers specifically assist patients and their families during their time in the hospital. Volunteers may choose to provide administrative support by providing data entry, clerical duties and customer service. 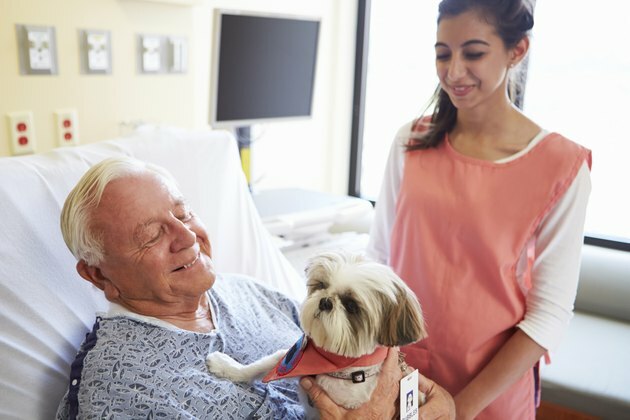 If volunteers wish to provide emotional support to patients and their families, they may choose to visit patients, provide counseling services, play with children or walk around the hospital with a service animal. Volunteering at a hospital benefits the volunteer, the patients, the families and the hospital workers. The volunteer often benefits from meeting new people, learning new skills, gaining experience and improving self-worth. Meeting new people helps improve social skills and increases the individual's social network. The volunteer may become friends with fellow volunteers or patients. Friendships are important for individuals. They help individuals get through tough times and contribute to a greater sense of confidence. Learning new skills is also a valuable benefit for the volunteer. The skills may help the volunteer with everyday tasks, such as operating a computer, or with career-related tasks that will help the individual obtain a job. Individuals wishing to go to medical school and work in hospitals will also gain relevant experience and boost their resumes. Some hospital patients may not have family or friends in the area to visit them. It can be a very lonely experience to combat an illness alone. Therefore, some hospital patients may significantly benefit from someone there to talk to them. Children may benefit from individuals playing games with them or having volunteer clowns and entertainers visit. Patients of all ages may also benefit from visits by service animals and their caretakers. Many hospitals allow certified dogs, cats or miniature horses to visit patients. To volunteer at a hospital, contact your local hospital or volunteer center to inquire about available positions. Once you have a list of the positions, evaluate them to determine which area you are passionate about. You may prefer to work with children, elderly, adolescent or adult patients. You may also choose whether you prefer working directly with patients or in a data entry type of position. If you choose a position you will enjoy, the you and the patients will receive greater benefits. After you have made your choice, contact the hospital volunteer coordinator to set up a meeting or orientation. Some hospitals may have an age limit for volunteers. Also be aware of the fact that many may require tests or vaccinations before volunteering for safety reasons. If you are unable to volunteer because of an age limit, consider volunteering at other organizations.